costs and economics; use restricted primarily to higher value crops in cash economy. phytotoxicity; may only be available for preplant use. lack of specificity; disruption of the soil food web, including antagonists, competitors and beneficials. residue problems; soil, groundwater, food - Prop 65 and other legislation. 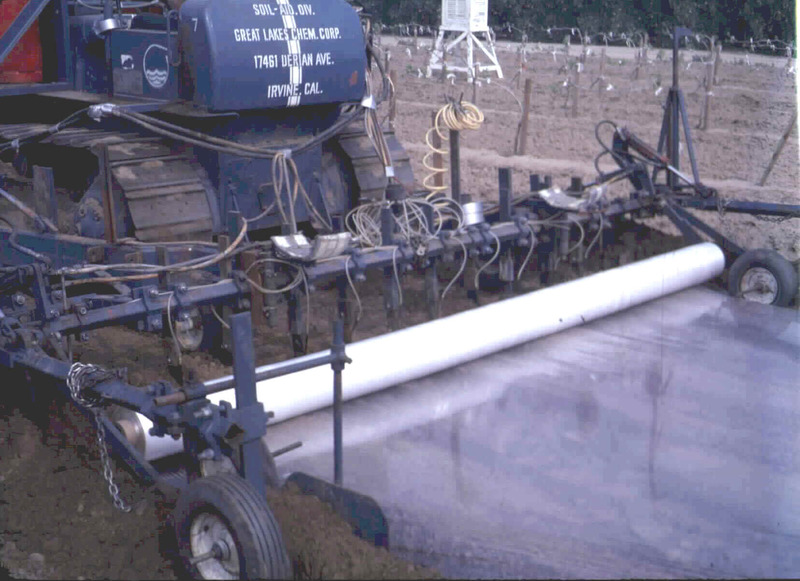 non-visible target; volumes of soil are treated rather than foci of infestation; saturation rather than precision application. movement and persistence; chemical may have to permeate the soil from the site of application in order to contact target nematodes, and be sufficiently persistent to achieve lethal concentrations at each site. dissipation; after lethal dose has been delivered, chemical should break down or otherwise dissipate in the environment to allow plant growth and soil food web recovery. amounts and technology for application; volume of soil to be treated requires transportation, handling and application of large volumes of toxic materials. 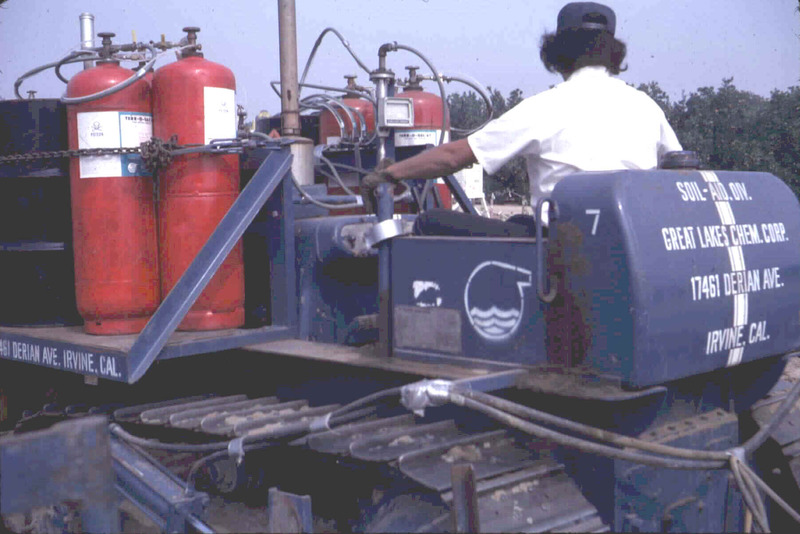 Older equipment introduced fumigants to appropriate soil depths but was not well-engineered for ensuring transfer to and from the delivery tank without escape to the atmosphere or human exposure. human toxicity; health hazards and risks associated with volatility, manufacture, handling, application and accidents; materials may have high mammalian toxicity and/or be suspected carcinogens.. There are two main categories of chemical nematicides based on their volatility - non-fumigants and fumigants. Fumigant nematicides disperse through the soil as a result of their volatility. Non-fumigant nematicides must be mechanically mixed throughout the soil profile, or spread in aqueous solution. Non-fumigant nematicides have low volatility and diffuse through the soil (generally for short distances only) disoolved in the soil solution. Their movement may be enhanced by water movement through irrigation or rainfall. If in granular formulations, there distribution may be enhanced by physical incorporation into the soil. Two main groups of chemicals, carbamates and organophosphates, and some alternative materials. EPA Administrative Review, August 2006.
applied to soil in water or incorporated. granular (10G and 15G) and liquid (Nemacur 3) formulations. The Nemacur 3 formulation is used in tree and vine plantings in California. A pesticide that Sonoma County officials believe killed some 400 birds last month has been banned from farms and vineyards. The Sonoma County agricultural commissioner is refusing new applications to use Nemacur after birds were found dead near a Geyserville vineyard. .............there may have been a leaking pipe when the chemical was applied in a vineyard....birds drank from contaminated water. County agricultural officials said there probably won't be any widespread impact because the season when it is usually used in vineyards has passed. Nemacur has been linked to bird kills in the past according to the US EPA. Phenamiphos is reported to become less effective when applied repeatedly to soils, possibly due to selection for organisms that degrade it more rapidly (Davis, et al., 1993; Johnson, 1998). 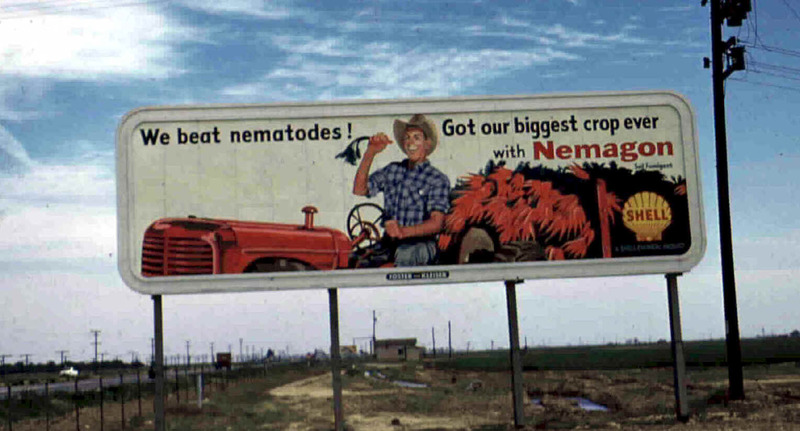 In consideration of the cost of obtaining additional safety data requested by the USEPA, Bayer Crop Sciences elected to voluntarily withdraw the registration of Nemacur in the USA effective May 31, 2007. Revised labels have been submitted to USEPA to implement risk mitigation measures. production capped for each subsequent year at 20% of the previous year's production during the 5-year phase out period. As of May 31, 2007, all sale and distribution by Bayer, the sole registrant, of existing stocks (manufacturing-use and end-use products), shall be prohibited in the USA. Persons other than the registrant may sell and distribute such products until May 31, 2008. Use of stocks in the channels of trade may continue until depleted, except where prohibited by the label. Any distribution, sale, or use of existing stocks after the effective date of the cancellation order that the Agency intends to issue that is not consistent with the terms of that order will be considered a violation of section 2(a)(2)(K) and/or 12(a)(1)(A) of FIFRA. Manufacture, sale, distribution and usage of Nemacur continues in the rest of the world. Primarily a fungicide but also registered as a nematicide. THIODICARB: Dimethyl N, N' [thiobis[(methylimino)carbonyloxy]]bis[ethanimidothioate]. 24% by wt. Registered as a cotton seed treatment in some US states. according to the manufacturer, Bacillus firmus protects turf roots from nematodes so that roots grow deeper and turf looks healthier. suppress nematode populations in soils. Debug Manufacturer / Distributor: Agro Logistic Systems, Inc.
(fungal metabolites: Myrothecium verrucaria fermentation products) Introduced: 1996?? DiTera ES is a liquid formulation. DiTera G and DiTera WDG are granular formulations. Good mammalian and non-target toxicity characteristics. Granular and emulsifiable concentrate formulations. Main ingredients are saponins from Quillaja saponaria trees (Soapbark), native to Chile. OMRI Listed for organic production. Liquid extracts of tree biomass are refined to remove colloids then heat concentrated. Rich in saponins, polyphenols, sugars and salts. Can be applied through drip irrigation or applied at surface and incorporated. Phytotoxic, must be applied at least 10 days before planting. Considered non-hazardous per OSHA criteria; may be hazrdous if absorbed through skin. Applied through irrigation system for management of nematodes in soil; sprayed on leaves as a fungicide. Fumigant nematicides are generally chemicals with high volatility. They move most rapidly through the air speces between soil particles. Therefore, their movement may be restricted if soil pore spaces or pore necks are filled with water. Aklso, since nematodes are resident in soil water films, Henry's constant (kH), the propensity to partition between the soil water and soil air phases, may be important. Also, volatility will be affected by soil temperature: lower in cool soils, high in warm soils. Two main groups of chemicals, halogenated hydrocarbons and liberators of methyl isothiocyanate or other volatile chemicals. injected into soil or applied at surface. First tested as a preplant soil fumigant in 1920. 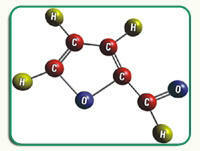 Chloropicrin (molecular weight 164.4) is a small, single-carbon molecule that diffuses rapidly through soil. It is a clear, colorless, nonflammable liquid with a moderate vapor pressure (18.3 mmHg at 68oF) and boiling point (234oF). Chloropicrin is a strong lacrimator and therefore an irritant if it escapes from the soil. Chloropicrin is injected as a liquid 6-10 inches below the soil surface, 14 days or more before crop planting. Released to the atmosphere it photodegrades (half-life 20 days) to phosgene and nitrosyl chloride. The Montreal Protocol required a 25% decrease in use of methyl bromide between 1991 and 1999. That goal was met by 1998 in California but there was a slight increase in 1999. In 2001, usage is required to drop to 50% of 1991 levels. The price of methyl bromide more than doubled between 1997 and 2000. By 2003, methyl bromide production/import must drop to 30% of the 1991 baseline. The pesticide is to be completely phased out by 2005. The phase-out of methyl bromide is based on purported damage to the earth's ozone layer by bromine and chlorine interacting with elevated temperature. Critical Use Exemptions (CUEs) may be granted where the case is made that there are no viable alternatives and significant economic damage may result from lack of availability of methyl bromide. Telone EC is the drip irrigation formulation of Telone II. 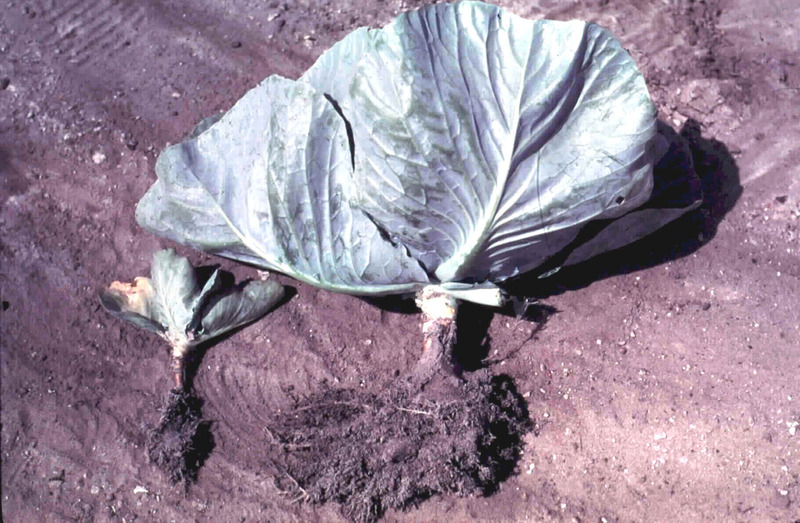 Cabbage plants grown in plot fumigated with Telone (right), unfumigated (left). Telone C17 (17% chloropicrin) is still available in some states, but not in CA. When the grower is in a situation that calls for 1,3-D plus chloropicrin in a high value crop, it is generally better to use Telone C-35 which has more chloropicrin than could be delivered with Telone C-17. However, chloropicrin is an expensive component. There are certain markets where the C-17 formulation is more affordable, for example, pink root control in onions in the Pacific Northwest. Telone C-35 contains 35% chloropicrin. The chloropicrin provides a greater level of fungicide activity. This is the product now available in CA. When the grower is in a situation that calls for 1,3-D plus chloropicrin in a high value crop, it is generally better to use more chloropicrin than could be delivered with Telone C-17. However, chloropicrin is an expensive component. There are certain markets where the C-17 formulation is more affordable, for example, pink root control in onions in the Pacific Northwest. Chloropicrin content is limited to 35% due to product stewardship and reactive chemical concerns. Testing indicates that, at concentrations above about 45% chloropicrin, the mixture becomes shock-sensitive, and under extreme impact situations, could detonate. 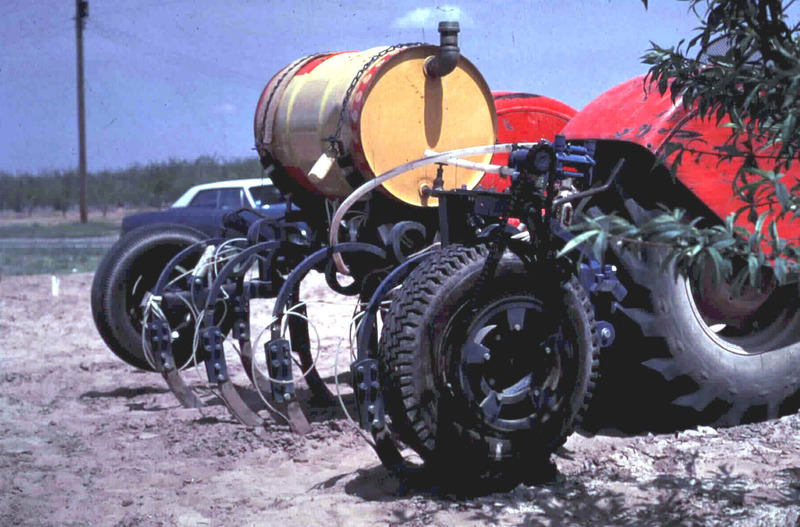 Custom applicators still have the option of increasing the chloropicrin/1,3-D ratio by using a dual injection system on the field applicator. The mixing then occurs in the soil. Some custom applicators now offer this option. There are application restrictions in California, limited amounts may be applied per region. InLine is the drip irrigation formulation of Telone C-35. Information from Jim Mueller (2001), DowAgrosciences. Telone EC Emulsifiable concentrate form of Telone II for drip irrigation application through surface or buried drip tape. Area must be tarped for 14 days after application (see news release below and product label). InLine Drip irrigation formulation of Telone C35. Application is through surface or buried drip tape. Area must be tarped for 14 days after application (see news release below and product label). Curfew Liquid formulation for application in turf. Becomes a fumigant in contact with Nitrogen. formulations, Telone II and Telone C35. 1. Telone EC and InLine may be applied through surface or buried drip tape. Its risky to list names, because some key researchers might be overlooked. Sipes and John Darsow. Key contributions were made later by many, including Ole Becker, Tom Trout, Husein Ajwa, John Duniway, Steve Wilhelm, Christopher Winterbottom, Frank Sances and others. On January 28, 2002 the California Department of Pesticide Regulation announced a restructuring of the use management plan for Telone Products. The refinements will maintain existing protection of public health, while making these key products available to more growers, and will assist growers in their transition away from methyl bromide. Permit conditions for the use of products containing 1,3-D currently allow the application of a maximum of 90,250 adjusted pounds of 1,3-D per township per year. Adjustments to the applied amount are based on the application method used and the 1,3-D content of the product. For example, when Telone II is applied at a depth of 18 inches and followed by a disk and roller, each gallon applied counts as 1 gallon (10 pounds) toward the township cap. When InLine or Telone EC are applied through drip irrigation under standard plastic film, each pound of 1,3-D applied counts as 1.16 pounds towards the township cap. For the next several years, use will be allowed above the cap in townships where use since 1995 has been significantly under the amount allowed by the cap. This increase is limited to 180,500 adjusted pounds of 1,3-D per township per year. Due to the limited use of 1,3-D since 1995, most townships will have access to 180,500 adjusted pounds of 1,3-D per year. CDPR and Dow AgroSciences both recognize that this refinement is part of a short-term solution to the township cap issue. We will continue to work with CDPR on further refinements, such as regional or area-specific township caps. I will continue to keep you informed of regulatory progress with Telone Products. Registered for applications in established turf in: Alabama, Florida, Georgia, Louisiana, Mississippi, North Carolina, South Carolina and Texas on golf course putting greens, fairways and tees, and also on athletic fields. Must be custom applied by authorized operators. 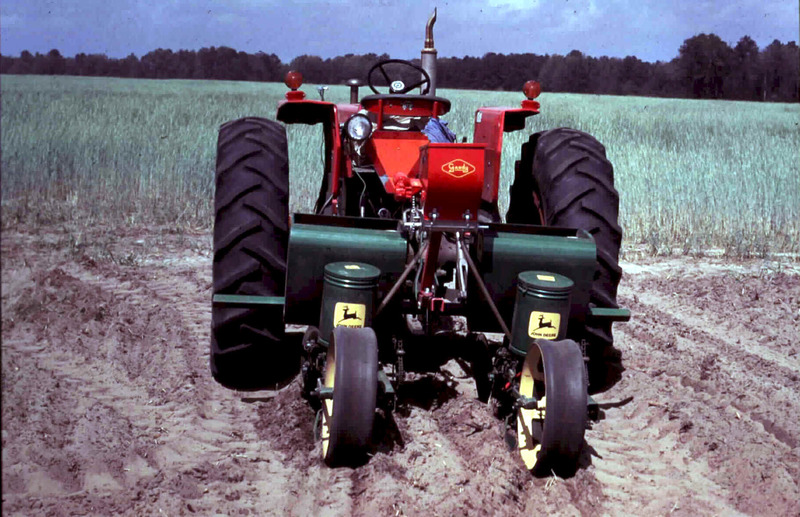 Soil should be moist and have a nitrogen application prior to treatment. Curfew is shank-injected as a liquid and converts to a gas which moves rapidly through soil. Kills nematodes and soil insects on contact. Some dead leaves and runners from mechanical damage at injection slits seen 1 to 2 days after treatment. Injection slits remain visible but begin to disappear 7 to 14 days after treatment. Injury associated with application no longer visible; darker-green turf in area of injection slits 14 to 21 days after treatment. 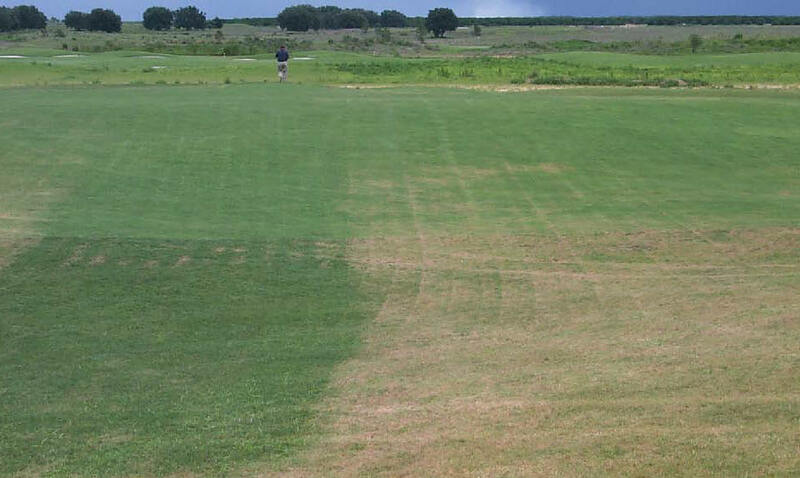 Above-and below-ground improvement in turf growth and development; darker-green turf associated with injection slits may coalesce, resulting in more uniform appearance 21 days and beyond after treatment. Turf roots after application of Curfew (left); Nemacur (center) and untreated control (right). "Fertility Interactions: Fumigation may temporarily raise the level of ammonia nitrogen and soluble salts in the soil. This is most likely to occur when heavy rates of fertilizer and fumigant are applied to soils that are either cold, wet, acid, or high in organic matter. To avoid injury to certain crops including red beets, carrots, corn, radishes, cole crops, legumes (beans), lettuce, onions, and sugar beets, fertilize as indicated by soil tests made after fumigation. To avoid ammonia injury or nitrate starvation (or both) to crops grown on high organic soils, fertilizers containing ammonium salts are not recommended." applied in water or injected. A very effective soil fumigant for the suppression and/or control of nematodes, soil-borne diseases, insects, weeds and germinating weed seeds. K-PAM® HL™, in combination with Telone® or chloropicrin, is a viable alternative to methyl bromide. It can be applied commercially to various fruit and nut tree crops, vegetables and ornamental plant production. Proper application is the key to success. Because of its unique potassium properties, K-PAM HL often produces better yields and quality on salt sensitive crops, or crops grown in soils high in calcium carbonate, sodium or with a high pH. 1995-2008 Product has been owned by Union Oil, then Entek subsidiary of DuPont and currently by Arysta Life Sciences North America. Materials that can be applied to the aboveground parts of plants and that are systemically translocated throughout the plant, or to specific parts of the plant (leaves, roots, etc.). Movento™ is described by the manufacturer as "a revolutionary new insecticide with unique “2-way systemicity”, which distributes the active ingredient upwards and downwards in the plant to find and eliminate even hidden pests wherever they live and feed." Movento has potential to be an important addition to pest management programs in grapes, citrus, vegetables, tree fruits, tree nuts, Christmas trees and hops. Preliminary testing by M.V. McKenry (University of California Kearney Agricultural Center) suggests that the materials exudes into the rhizosphere and kills both plant- and microbial-feeding nematodes. To maximize leaf uptake and systemicity of the active ingredient, Movento must be mixed with a spray adjuvant that provides spreading and penetrating properties. also considered capable of downward translocation to roots following foiar application. "For use on fine turf, golf courses, sports fields and lawns"
I don't think this material has been tested in California. Registered in US for nematode control on golf courses and turf farms. Discovered by a German chemist, Döbereiner, 1820; first commercial production in 1922. Flammability is similar to diesel. It is an aldehyde and chemically reactive. Internationally rated as GRAS (GRAS: Generally Regarded As Safe) when used as a flavor. The very low volatility reduces the toxicity risk. It is metabolized rapidly and excreted in the urine as furoylglycine. Furfural is formed from pentosan, a five-carbon cellulose which occurs in corncobs, bagasse, wood chips and other organic material. The organic source is heated to 100°C, the pentosan is hydrolysed to the soluble sugar pentose (xylose) and dissolves in the available water. Dehydration of pentose to furfural is by acid catalysis. 2. Nematicides in soil are in dynamic equilibrium among the three soil phases: 1) solids (adsorbed to clay and OM), 2) soil solution, and 3) soil air. Non-fumigants are mainly distributed in phases 1 and 2, movement IS by mass flow. Fumigant movement determined by vapor pressure and kH, move 1000x faster in air than in water. content; e.g., problems with 1,3-D efficacy in the Tulelake region were attributed to the narrow temperature and moisture window prior to potato planting, and high adsorption in highly organic soils. Consider the principle of attempting to deliver a standard dosage to the target (standard concentration*time product; e.g, 50 ppm for 4 days and 100 ppm for 2 days both give a dosage of 200 ppm-day) (McKenry and Thomason). The chemical formula for DBCP is C3H5Br2Cl, and the molecular weight is 236.36 g/mol. DBCP occurs as a colorless liquid when pure, and commercial grades as a dark-amber to dark-brown liquid that is slightly soluble in water. DBCP has a pungent odor with an odor threshold of 0.3 mg/m3. The vapor pressure for DBCP is 0.8 mm Hg at 21 °C, and its log octanol/water partition coefficient (log Kow) is 2.43. Until 1977, DBCP was used as a soil fumigant and nematicide on over 40 different crops in the United States. A high incidence of male sterility was reported among workers at the Occidental Petroleum plant in Lathrop, CA, where DBCP was manufactured, in early 1977. Additional, and presumably confirmatory, studies were conducted at DBCP-manufacturing plants of Dow and/or Shell in Texas. From 1977 to 1979, EPA suspended registration for all DBCP-containing products except for use on pineapples in Hawaii. In 1985, EPA issued an intent to cancel all registrations for DBCP, including use on pineapples. Subsequently, the use of existing stocks of DBCP was prohibited. Acute (short-term) exposure to DBCP in humans results in moderate depression of the central nervous system (CNS) and pulmonary congestion from inhalation, and gastrointestinal distress and pulmonary edema from oral exposure. Chronic (long-term) exposure to DBCP in humans causes male reproductive effects, such as decreased sperm counts. Available human data on DBCP and cancer are inadequate. High incidences of tumors of the nasal tract, tongue, adrenal cortex, and lungs of rodents were reported in a National Toxicology Program (NTP) inhalation study. EPA has classified DBCP as a Group B2, probable human carcinogen. Davis, R.F., A.W. Johnson and R.D. Wauchope. 1993. Accelerated degradation of fenamiphos and its metabolites in soil previously treated with fenamiphos. Journal of Nematology 25:479-485. Johnson, A.W. 1998. Degradation of fenamiphos in agricultural production soil. Journal of Nematology 30:40-44. Thomason, I. J. 1987. Challenges facing Nematology: environmental risks with nematicides and the need for new approaches. In J.A. Veech and D.W. Dickson (eds) Vistas on Nematology. Trout, Tom. 2001. Fumigant use in California. USDA-ARS, Fresno, California.